All of the knives in the Ultimate Series receive a sub-zero, or cyrogenic treatment in the forging process for the best in edge retention. The blades are the thickest of all the Mac lines at 3mm. (The Ultimate Cleaver mac SDK-85 is 4mm). 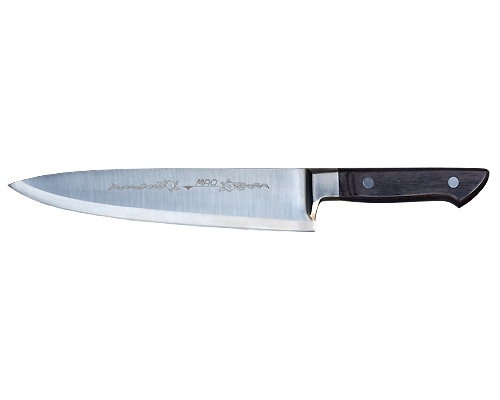 This series of knives is designed to provide the heft and feel of a German knife, while maintaining a thin kerf at the cutting edge. The ultimate combination of high carbon steel, Chrome, Molybdenum, Vanadium, and Tungsten Carbide makes the blade harder and more durable than most other brands. Resistant to rust and stains. Razor-sharp straight-slicing edge and comfortable balance. Strong all purpose chefs knife for the professionals and cooking enthusiast alike. 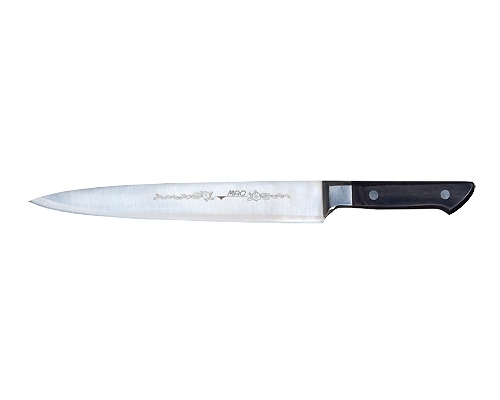 Hardness is between 59 and 61 degrees Rockwell C.
Identical to the SBK-95 except for a longer blade.